I reached my 1,500th post over the weekend. I've been blogging for four years now and it has changed my life so much. Thank you for being part of my adventures. 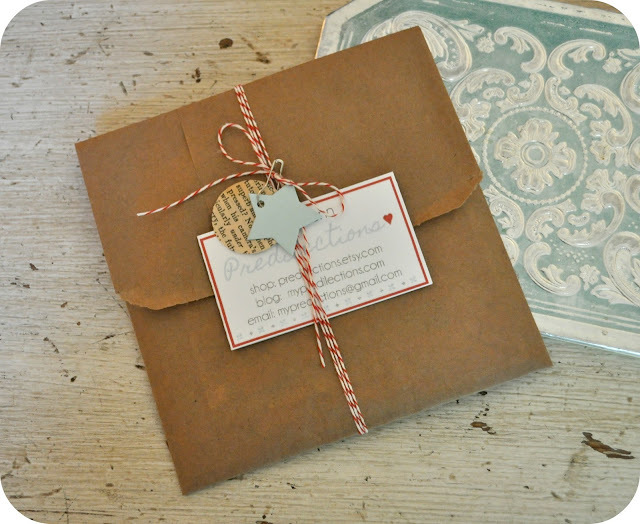 My dear friend Jill recently opened up her Etsy shop, Predilections, where she sells her hand made greeting cards. They are so thoughtful and pretty and I love how she wraps them up. Anyhow, sweet Jill made two cards for you. To celebrate reaching 1500 posts, I will be making the winner a care package (I love love love making care packages) which will include two of Jill's creations. To enter, be a follower of Fritzi Marie, show Jill some love on her blog or Etsy shop and leave a comment here. Bono Baby will pick the winner on Friday, September 30th. p.s. Do you remember going to the Hello Kitty / Sanrio store when you were a little girl and lusting after their mystery bags? This giveaway is a little bit like one of those tempting grab bags. I will be adding personalized goodies to the care package to go along with Jill's fabulous cards. Hooray Kitty! I hope #1500 of many, many more! I'm off to see Jill's shop & blog. Squeee! What a gorgeous shop, I love the cards that she made! awww, congrats to your most talented friend jill! these are BEAUTIFUL!!! i just favorite-d the "happiness always" card and i'm off to check her blog! you are the sweetest blogger i know. i'm so glad to know you and blessed to call you a dear friend. here's to the next 4 years of blogging and what an adventure lies just in front of you... i'm overjoyed to be able to be part of it through your magical words and photos. What a sweet celebration! I stopped by to give Jill some love & of course I follow you - one of my daily reads :) I totally loved going to the Sanrio store with my friends at the mall after school when I was in junior high. That little penguin character was my fave & I love Hello Kitty now. Have a lovely day!